Ready for the job, the Ellison Steel Toe is a 6-inch tall men's boot with a versatile and simple rich brown leather exterior. The antique brass non-tarnishable hooks and eyelets and heavy duty laces are crafted for durability. The steel safety toe cap meets or exceeds ASTM F2413-11 standards for impact and compression and guarantees non-electrical conduction of electrical potential or magnetic charges. It has 5 Iron Texon® insoles that allow for a relaxed and comfortable fit and the fiberglass shank offers stability. This boot features a Vibram® outsole that provides maximum traction on wet or dry surfaces and various terrain. Made in the USA with global parts. I've already had a couple of women compliment me on these boots after only two weeks of wearing them! These are definitely THE most stylish and fashionable steel toe boots/shoes available. They are simple, sleek, sophisticated, and refined. In a world of unnecessarily bizarre looking steel toe footwear, these boots will make you stand out in a very good way. Comfort is pretty good. There are a couple of pressure points on the top of the boots, but I also have skinny and bony feet so I am prone to feeling slight imperfections in shoes. Also, I value style far above comfort, so comfort isn't super important to me. These boots look awesome! I bought this pair of Chippewa because they were on sale and I needed safety boots for work. Little did I know that I was about to wear the most comfortable boots ever! They felt great can't even tell they were steel toe, and the smell and feel scream pure quality leather. Best boots I have owned thus far. Don't even need to break them in. These were very comfortable right out of the box. Quality construction. Non of the issues I've found with some other brands. Tongue stays centered, laces stay tied. Overall very happy. I will buy more from Chippewa. Love my boots but they have some obvious defects that were ignored. The stitcher on the sole missed so there is extra holes in the wooden part (I think it's wood). Nothing that messes with the function. I kept them because of the hassle to return and replace. I'm overseas military and the shipping was surprisingly fast. I wear boots every day, These are very comfortable. They come lighter then the picture suggests, but with a little leather treatment they're dark. Fit was perfect. Fit great. Look even better!!! I've owned these boots proudly for about a month. Been wearing them 5 days for work and casually on the weekends since I really like them. 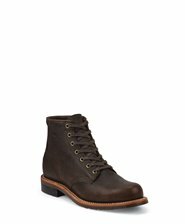 These boots can be slick on the soles so just use your common sense probably not good for the snow but anyways I ordered them in a size 8.5D. I wear a size 9 in Vans and size 9 D in Ariat work boots so I went down half size like Chipppewa suggests and they ended up fitting great not too tight and not loose just enough room for foot to move the insoles have great arch support and seem to be lasting. It took me about a week to break them in. The laces, American flag, and trim are awesome they really make these boots stand out. if you have a thing for leather and wood this boot is for you . Going to have to buy another pair soon. Haven't applied any mink oil or any kind of leather softener. I had the boots for only a few weeks now and they are by far the lightest and best looking steel toe work boots I ever owned. They are comfortable right out of the box. These boots are awsome..This was the 4th pair in a row no need to try anything else! I just got these for Christmas to replace my steel toe timberland pro series. I do like them. Very comfortable. and they look nice. Only complaint is they have no traction like they claim to. Was walking in the snow and was sliding everywhere. Also my feet were cold. Think I'm gonna stick with my tims for the winter. I had to give these boots to a friend after wearing them for a week. They are not good outdoor work boots, especially not in the snow. I was mistaken. When I ordered, I reduced the size by 1.5 to match my female foot size, but they were still too large by a full size. 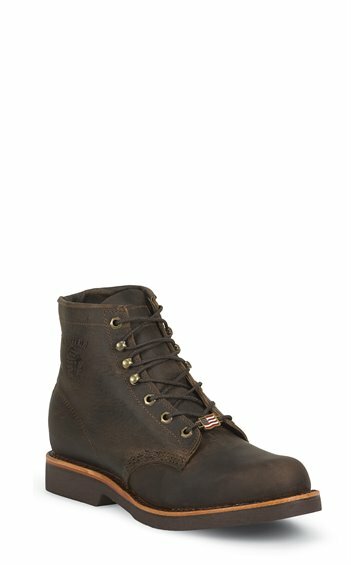 I wish there was a more comprehensive women's sizing chart and more options for good looking, rugged boots for women! I thought I was purchasing a boot that would last for years to come but was severely disappointed that after nine months the sole started wearing down at a rate of nearly a 1/8" a week. Every fabricator in the shop couldn't believe that Chippewas held up so terribly. After 15 months they are now unwearable. I would've considered getting them resoled but due to the steel toe being almost entirely exposed as the leather has several large tears, I can't justify it. It's extremely disappointing since they were a sturdy, comfortable boot otherwise. But the just don't hold up to full-time metal fabrication. Owned these for a couple of years and wear them motorcycle touring. They're still going strong. I'll need to have them resoled soon. I can wear them all day in comfort. The quality is great and they look better as they're worn. I waterproof and condition them regularly. I was worried that you couldn't have a steel toe, a comfortable feel, and a cool look, but these have it all! Quality soft leather. Squeaks at first rubbing against the steel toe, but broke in and stopped in a few days. I had to get a half size down from my normal shoe size. Low quality leather. Scratches easily. Very apparent creases after first ware. I've owned plenty of boots (all different price ranges and forms of quality). Will never buy Chippewa again. These boots would never hold up as work boots. Love them, best work boots ever. I've had 5 pairs. Prior to, every other boot I owned had a problem - not comfortable, short life, made my feet wet, etc. These are perfect. They breathe like a sock. They're super comfortable for all day on concrete. They look good. And they last plenty long enough. I'll continue to buy them, especially because MADE IN USA! Most comfy boot out of the box i have ever worn. Perfect fit, great color. Co-worker noticed the first day i wore them and said "that is a great looking boot! ".